As you first look at it, this game is a thing of beauty. It comes in an MDF box which is just over 6″ square – this doubles not only as the game box, but also as a ‘Boss’ room in the game. Remove the lid and the rules and the rules and you have a layer which holds the miniature bases, connectors for the dungeon pieces, plus a bag of miniatures and a couple of gem dice. The next layers have a number of corridor sections, some small rooms, and then the main ‘Boss’ room. Couple this with a set of MDF doors, and you have a rather marvellous little feat of engineering – which even all goes back in the box once you’ve unpacked it! As you open the box there is that unmistakeable aroma of burnt wood – something a little different from the usual ‘new game smell’ – all the pieces are well made, and the dungeon kit looks great. There are six heroes characters, and a host of bad guys. The game is themed around a dungeon full of Goblins and Orcs, and so the models match, with a mix of these figures, a couple of ‘Bosses’ in the shape of an Orc Warlord, a Shaman, a Troll and a Stone Golem, plus some swarms creatures : giant rats and spiders. The figures are generally well cast and sculpted, with little flash. …and ground to a halt. With the best will in the world, it would be remiss of me not to point out that the rulebook is something of a mess. Whilst divided into three parts (Playing the Game, Character Creation, Dungeon Creation) it is very badly organised, with rules seeming placed as the authors thought of them, so rules covering doors, traps and corridors are in ‘Playing the Game’ rather than ‘Dungeon Creation’, and character stats and skills are dicussed in ‘Playing the Game’ rather than in ‘Character Creation’. Most of the rules are there, it’s just that the rulebook could do with a major overhaul and re-edit. But why did we grind to a halt? Well, we could have carried on, but we would have made to make a couple of assumptions which may, or may not, have been correct. The gaping hole in the rules comes when placing wandering monsters on new terrain pieces – there are no rules which then describe how these new creatures fit in with the current turn sequence – so we hit a ‘what do we do now?’ question which didn’t have an obvious answer. Yes, you can work it out (and, if fact, there is a description of the action for knocking down doors which sort of covers it) but the rules should be written clearly, without assumptions or hidden descriptions having to be made/found. In truth, it’s a disappointment in what is otherwise a really good product, and one which is actually easily fixed. The rulebook is available as a PDF and the core mechanics look pretty sound, so it should not be too much work to sort out the rules. We will certainly be giving this game another play in the near future. 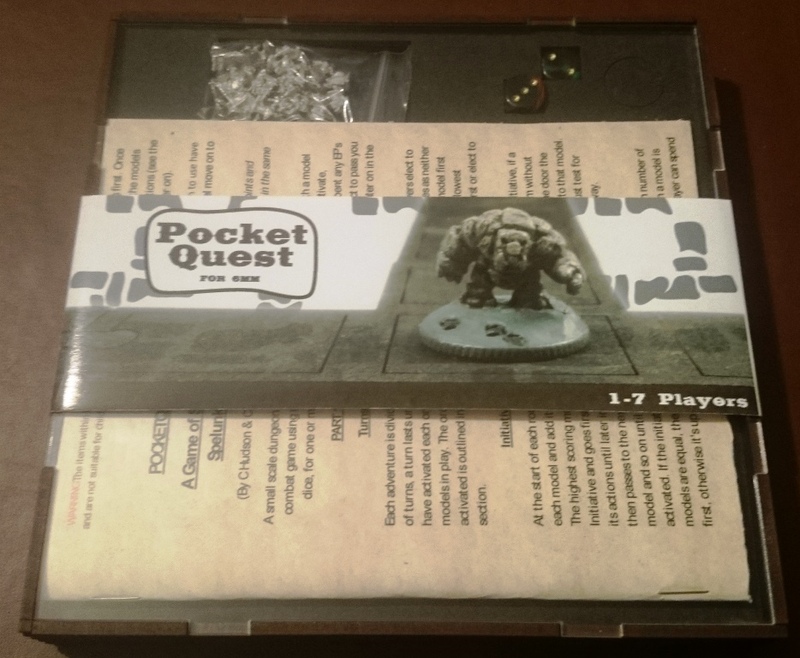 You can purchase Pocket Quest from Miniature Architect and Perfect 6 Miniatures. An interesting concept: A whole Dungeon in a box. The price of 30 GBP seems fair for what you get, but I feel the tiles are not exactly very detailed. They do not evoke a sense of place. I think engraving a flagstone pattern or something would have gone a long way or is the idea that you only get the featureless tiles and you go and paint them and add detailing? I think it would be alright as you get some precision in your designs with the laser cut pieces that is hard to achieve by hand, but maybe they should make buyers aware that they need to put a bit of effort in to make it visually appealing (apart from painting the miniatures). To be fair, there are some flagstone details on the tiles. However, I think due to the dark colour, they are not clearly defined, and so don’t stand out.